Enjoy this offering from my friend Mr. Harold Caldwell, a fellow historic interpreter and 18th century chef. Here in this brief but informed piece he argues for a serious and dedicated study of early African American foodways in the spirit of informing the total American narrative. So no its not just me! Enjoy! Thank you brother Harold! Interpreting colonial African American foodways is a difficult enterprise. Documentation is sparse at best and sometimes difficult to research. The interpretation of African American food and it’s impact is not common at most museums in America. Many foodway interpreters believe that it’s interpretation is unimportant and uninteresting. This maybe because talking about African Americans and slavery is either uncomfortable or unnecessary to them. And some foodways scholars convey that if documentation barely exists, this topic is irrelevant. Of course I disagree with their summation. That ideology has served to the detriment of interpreting African American foodways. African American food has a history, as does every kind of ethnic food in the United States. And it’s history predates the founding of America. It is our responsibility as foodways interpreters to tell the “other side” of American culinary history. This debate has been on-going for many years and this article will dispel these myths. I will explain what academic resources are available to aid in the interpretation of colonial African American foodways. I will also delineate how to gather the information and formulate the resources into a credible interpretation. 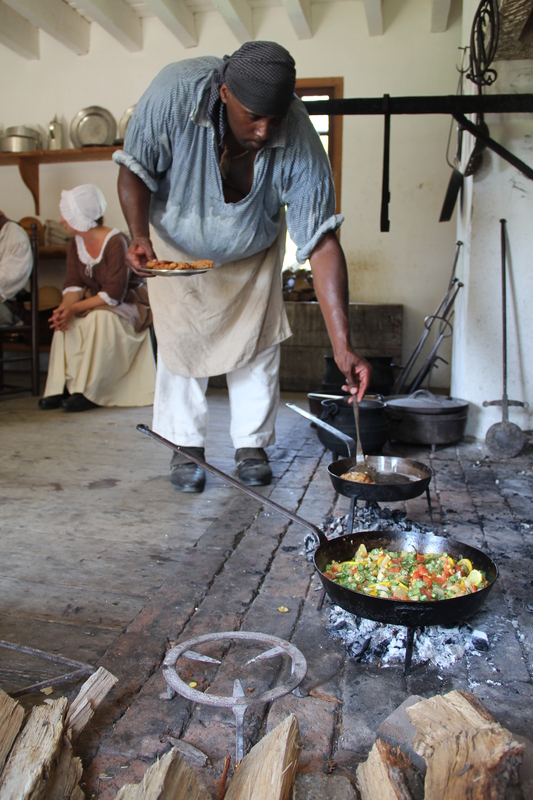 Documentation concerning African American food during the colonial period is limited. Information is relatively scarce because slave masters did not consistently record what foodstuffs the enslaved were consuming. Also, most slaves of the era were illiterate. How would the enslaved record information without the basic knowledge of reading and writing ? The methods of preparing food would be orally passed down with the absence of written language. And for the enslaved who had the privilege of reading and writing, there was little time to write. Despite the limited amounts of documentation concerning African American food during the colonial period, there are reliable references. Much of the information stems from non African Americans from the seventeenth and eighteenth centuries. Some of the documentation comes by way of travelers, slave masters, and tutors. For example, in The Journal and Letters of Philip Vickers Fithian (1773-74 ), the tutor describes a slave’s ration as “a peck of corn and a pound of meat a week.” Additionally, there is documentation of certain wild game that slaves were known to have an affinity for – possum and turtles. This documentation is according to The Travel Journal of William Hugh Grove, in Virginia in 1732. The traveler says “ Turtles…The Negroes eat them…” These references reveal the variety of food available to the enslaved and free colonial African American. It is important to note that eventually, as time went on, the enslaved culture possessed foodstuffs that would evolve into recipes. There are references to some West African recipes in Virginia cookbooks such as Mary Randolph’s, The Virginia House Wife. Mary Randolph exhibits receipts for gumbo, pepper pot soup, and akara (bean fritters). Even though Randolph’s cookbook was published in 1824, it is used to interpret colonial cooking. And it includes recipes that possibly descend from the prominent Randolph family of Virginia during the 1700s. This proves that slaves did orally pass down cooking traditions and it also proves that colonial African American foodways had an impact on colonial culinary history as well. In addition, it also bares proof that the enslaved continued the African tradition of cooking, utilizing not only African but European and Native American foodstuffs. Other means for interpreting African American foodways during the colonial period is employing archeological evidence from site excavations. 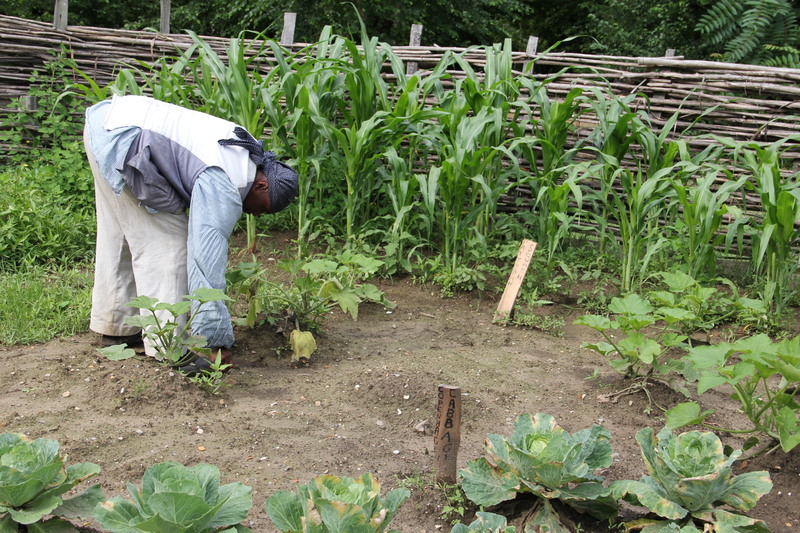 For example, the excavations at George Washington’s plantation, Mount Vernon, reveals a variety of food that slaves consumed. According to Slavery At The Home Of George Washington by Philip Schwarz, archeologists discovered the following remains at the site of family houses – beef, chicken, pork, and various wild game. Researching archeological documents can reveal what foodstuffs enslaved populations had at their disposal. An interpreter can postulate how these foodstuffs were cooked by researching inventories of slave owning plantations and properties. For instance, estate inventories make numerous references to pots and fry pans. Consequently, perusing these inventories can give an idea of how slave food was prepared. Pots could be used for boiling and Spider pans could be utilized for frying. It can be easily determined by looking at the instances stated above, how easily colonial African American foodways could be interpreted. Another example on how to interpret African American Foodways is to research daily work routines of the enslaved. 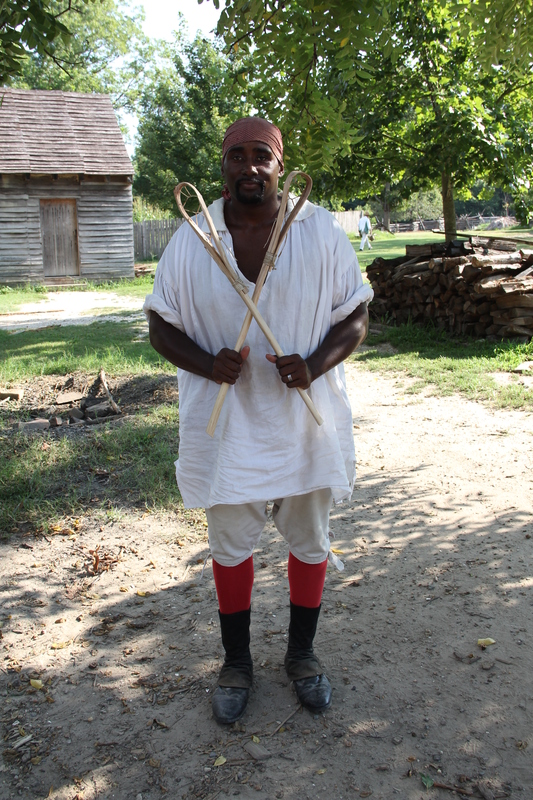 In the Journal and Letters of Philip Vickers Fithian(1773-1774), Fithian describes an enslaved person’s daily work routine as “they woke up at dawn and were immediately driven out into the fields and worked until about twelve and were seldom given an hour to take dinner. And they were driven back into the fields where they worked until daybreak.” Fithians’ reference to a slave’s daily routine also gives an example on cooking methods of the enslaved. 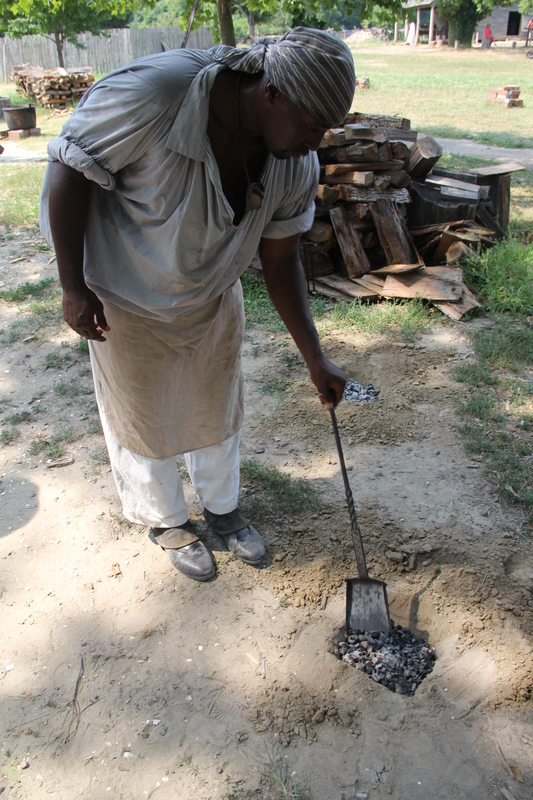 Without the luxury of time to prepare an elaborate meal one can speculate how the enslaved were preparing their meals. There would be two methods for preparing food under those circumstances – frying or stewing. 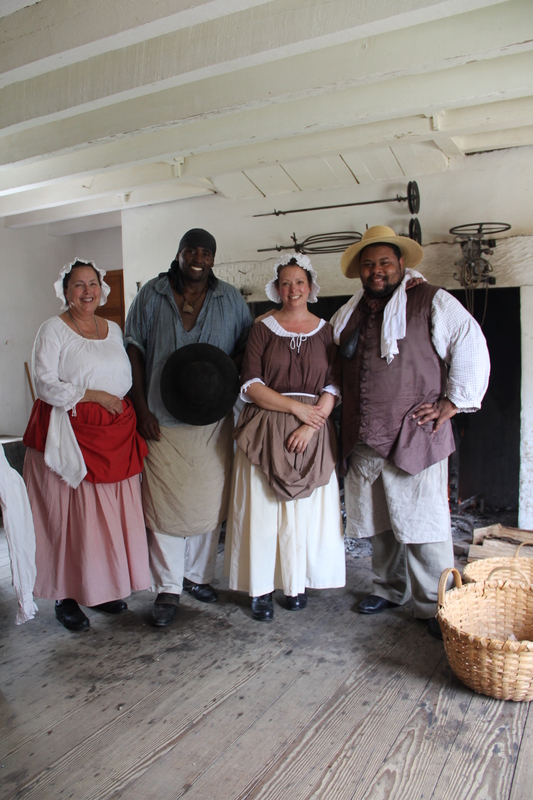 Interpreting African American Foodways during the colonial period affords an interpreter freedom to utilize a plethora of colonial period foodstuffs. A foodways interpreter focusing on African American food, does not have to rely solely on colonial cookbooks. In my opinion, focusing only on cookbooks, makes this kind of culinary interpretation – restrictive and somewhat unrealistic. As referenced above, the enslaved were provided rations in the form of “a peck of corn and a pound of meat a week.” In addition to having a small plot of land to grow their own crops, the enslaved hunted wild game as well as fished to supplement their diet. Subsequently, the evidence gives the interpreter an idea of how to portray African American Foodways properly and accurately. African American Foodways seem to be always under assault by those who rely solely on documentation. And because of this (in my experience), some foodways scholars question the validity of African American foodways. A foodways interpreter must be prepared to be challenged. Some of the interpretation will require a bit of inference in order to give an informative interpretation. For example, if an estate inventory revealed frying pans; an interpreter can infer that food could have been fried in them. So, even though there might not exist documents that say enslaved people fried food in fry pans, the interpreter can ascertain that food was fried. A foodways interpreter has to equip his or herself with archeological evidence and estate inventories. In addition to 17th and 18th century European, African and Native American food references, in order to compose a plausible interpretation of the culinary life of the colonial enslaved. It will be necessary for the interpreter to convey to guests and scholars that most 17th and 18th century African American recipes were not documented. And an explanation for why recipes were not recorded is important for the interpretation. To do the job right, it is imperative that the foodways interpreter possess confidence in the information that he or she is presenting. Confidence combined with documentation, imbues a sense of credibility in the information provided. It would also be helpful to the foodways interpreter to research African American foodway books, research papers, and articles. In conclusion, obtaining any and all information pertaining to colonial foodways can produce a credible, well-rounded, and knowledgeable foodways interpreter. Farish, Hunter Dickerson. Journal And Letters Of Philip Vickers Fithian (1773-74) Williamsburg, VA, 1957. Schwarz, Philip. Slavery At The Home Of George Washington, Mount Vernon, VA 2001. Housewife by Mary Randolph, New York, 1993.